Edited by Christophe Cherix, Cornelia Butler, and David Platzker. With texts by Christophe Cherix, Cornelia Butler, David Platzker, and Adrian Piper. Backmatter compiled by Tessa Ferreyros. Published 2018 by the Museum of Modern Art, New York. Hardcover, 352 pages. 373 illustrations. Features the full range of Piper’s work through more than 300 illustrations, and essays by the exhibition curators that examine Piper’s extensive research into altered states of consciousness; the introduction of the Mythic Being – her subversive masculine alter-ego; her media and installation works produced after 1980; and the global conditions that illuminate the significance of her art. Previously unpublished texts by Piper lay out significant events in her personal history and her deeply felt ideas about the relationship between viewer and art object. Edited by Cornelia Butler and David Platzker. With texts by Diarmuid Costello, Jörg Heiser, Kobena Mercer, Nizan Shaked, Vid Simoniti, and Elvan Zabunyan. Paperback, 280 pages. 127 illustrations. 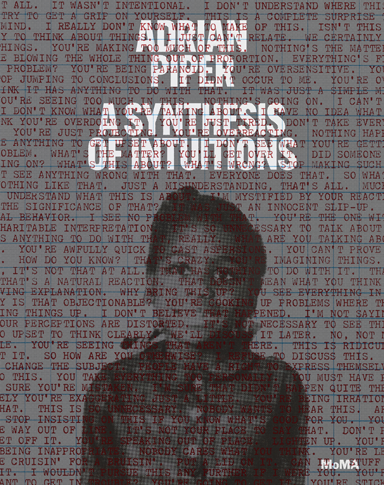 Presents a volume of new critical essays that investigate previously unexplored dimensions of Piper’s practice. Focused texts assess themes such as the Kantian framework that emerges from Piper’s philosophical studies; her contributions to first-generation Conceptual art; her turn from object works and works on paper to performance in the early 1970s; the work’s connection to her yoga practice; her ongoing exposure of and challenges to xenophobia and misogyny; and the relation between prevailing interpretations of her work and the viewers who engender them. Hardcover, 328 pages. 110 full-color images. In 2005 Adrian Piper secretly emigrated from the United States. Several months passed before anyone realized she had disappeared. She resurfaced in Berlin and has lived there ever since. Piper has consistently and firmly refused to return to the U.S. or explain why she left. Many assume it was because she discovered her name on the U.S. Department of Transportation Security’s Suspicious Travelers Watch List. Others point to Wellesley College’s forcible termination of her tenured Full Professorship. Yet others speculate that George W. Bush’s presidency, or American racism, or the invasion of Iraq compelled her to leave. All of these conjectures are groundless. ESCAPE TO BERLIN: A Travel Memoir is a gripping autobiographical narrative that provides a full account of the facts. The Humean conception of the self consists in the belief-desire model of motivation and the utility-maximizing model of rationality. This conception has dominated Western thought in philosophy and the social sciences ever since Hobbes’ initial formulation in Leviathan and Hume’s elaboration in the Treatise of Human Nature. Bentham, Freud, Ramsey, Skinner, Allais, von Neumann and Morgenstern and others have added further refinements that have brought it to a high degree of formal sophistication. Late twentieth century moral philosophers such as Rawls, Brandt, Frankfurt, Nagel and Williams have taken it for granted, and have made use of it to supply metaethical foundations for a wide variety of normative moral theories. But the Humean conception of the self also leads to seemingly insoluble problems about moral motivation, rational final ends, and moral justification. Can it be made to work? Free download here. Adrian Piper argues that the Humean conception can be made to work only if it is placed in the context of a wider and genuinely universal conception of the self, whose origins are to be found in Kant’s Critique of Pure Reason. This conception comprises the basic canons of classical logic, which provide both a model of motivation and a model of rationality. They also supply necessary conditions both for the coherence and integrity of the self and also for unified agency. The Kantian conception solves certain intractable problems in decision theory by integrating it into classical predicate logic, and provides answer to longstanding controversies in metaethics concerning moral motivation, rational final ends, and moral justification that the Humean conception engenders. In addition, it sheds light on certain kinds of moral behavior – for example, the whistleblower – that the Humean conception is at a loss to explain. Free download here. The APRA Foundation Berlin is pleased to announce a forthcoming series of print editions of texts by Adrian Piper, In the Margins Behind the Lines: Collected Writings. 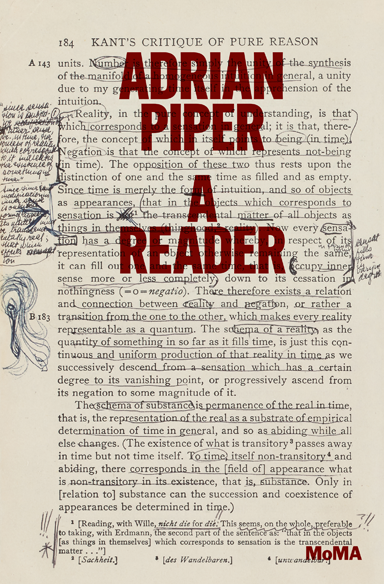 The volumes organize and present Piper’s writings in chronological order from 1967 to the present, with texts from all of the areas in which she has contributed – in art, philosophy, yoga and autobiography – placed side by side. This makes salient lines of influence, correspondence, cross-pollination and simultaneous development among these various fields, regardless of the institutional mores that often separate them. The volumes collect both previously published texts and illustrations, and also many that have never been published before. 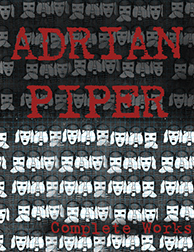 This definitive edition of Piper’s writings offers a new approach to her work, and to the large range of issues and themes with which it has been engaged for almost fifty years. In the Margins Behind the Lines. Collected Writings, Volume I.
Meta-Art, Art Criticism, Philosophy 1967-1976. In the Margins Behind the Lines. Collected Writings, Volume II. Meta-Art, Ripostes, Art Criticism, Autobiography 1978-1992. In the Margins Behind the Lines. Collected Writings, Volume III. In the Margins Behind the Lines. Collected Writings, Volume IV. In the Margins Behind the Lines. Collected Writings, Volume V.
Meta-Art, Art Criticism, Philosophy, Autobiography 1993-2001. In the Margins Behind the Lines. Collected Writings, Volume VI. Meta-Art, Ripostes, Art Criticism, Philosophy, Autobiography 2002-2012.